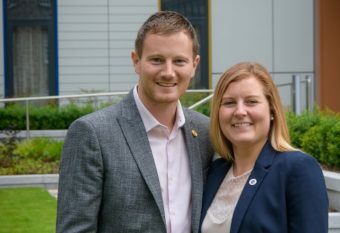 BNI Scotland North recognised business networking successes at its annual awards in Aberdeen. The organisation, which has groups in Aberdeenshire, Angus, Moray, Perthshire, Fife and the Highlands, held its 2018 event at The Chester Hotel. BNI (Business Network International) is the largest face-to-face business networking referral organisation in the world, with more than 240,000 members in over 8,600 groups operating across 69 countries. In 2017, BNI Scotland North generated £17m of business for members. BNI Scotland North has 15 established networking groups in total, with six in Aberdeen, two Dundee and further groups in Inverness, Elgin, Inverurie, Montrose, Peterhead, Perth and Dunfermline. BNI Scotland North is owned by Aberdeen-based Angela and Bryan Kinghorn. Nexus member Lesley Forsyth, of Montrose’s Greenpark Garage, was recognised for achieving Millionaire Givers status – one of only three current members to achieve the feat of passing on £1m worth of business. In addition, Edward Obi, of HR Hub Plus, was awarded the 2018 Regional Member of the Year accolade for his track record of supporting BNI and its members in the past year. Individual group winners, Aberdeen-based chapters unless stated, were Ivor Smith (Alpha); Edward Obi (Bravo); Neil Gordon (North); Debra Bruce (Aberdeenshire, Inverurie); Jai Aenugu (Energy); Isla Cruden (Highland, Inverness); Marie Johnstone (Moray, Elgin); Liz Carnie (Nexus, Montrose); Bev Boakes (Platinum); Pete Preston (Solar); Andy Walker (Synergy, Dundee); Sandra Stephen (Target, Peterhead); Dave Pryde (Fair City, Perth); Johnny Bissett (Carnegie, Dunfermline) and Kessar Salimi (Ultimate, Dundee). Energy group had the highest visitor rate, Highland had the best conversion rate, Platinum had the best retention rate, Synergy had the best net growth and Nexus had the highest number of referrals per members. Edward Obi was again a winner, this time in the Member Visitor Rate category, while Adrian Sangster (Energy) clinched the Member Referral Rate honour with 250 referrals. Liz Carnie (Nexus) won the Highest Member TYFTB (thank you for the businessAward, passing business opportunities which resulted in £700,000 worth of business in the past year. Scotland North members have access to more than 13,000 members in the UK and Ireland. BNI was founded by Dr Ivan Misner in the United States in 1985. In 2017, BNI passed more than 683,000 referrals worth over £520 million in the UK and Ireland alone. Members pay a joining fee and a monthly fee to be part of a group, which holds weekly meetings. Each group is formed on a competitor-free basis; only one business from a specific market sector is included in each group. BNI Scotland North has 400 members in total, and is also looking to grow groups running in Kingswells and Glenrothes.